The red tide is a major environmental concern this election season. Florida’s southwest coast has suffered from the most severe red tide to hit the state in more than a decade. The algae-choked waters of Lake Okeechobee and the deadly red tide along the Gulf Coast have dominated the political debate over Florida’s environment. Listen to the Aug. 24, 2018 episode of The Florida Roundup here. The Republican gubernatorial candidates have focused their environmental positions on the pollution-fueled algae blooms. 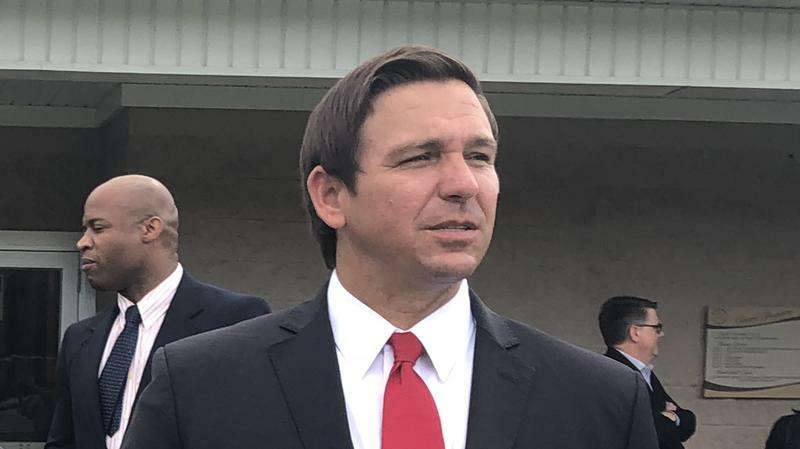 Earlier this month, during a televised debate on Fox, Congressman Ron DeSantis placed much of the blame for the state’s water woes on the sugar industry, accusing his opponent Agriculture Commissioner Adam Putnam of doing the bidding for big sugar. On the Democratic side of the governor’s race, real estate development and the environment have collided. Gwen Graham has faced scrutiny over her family’s ties to a proposed mega-mall on the edge of the Everglades in Miami-Dade County. Meanwhile, between now and Election Day, South Florida faces at least four “king tides” – and the threat of flooding that comes with those high tides. Higher sea levels have not been the environmental issue leading up to next week’s primary. The Miami Herald, the Sun Sentinel and The Palm Beach Post – with reporting from WLRN – have teamed up to address sea-level rise in South Florida. The newspapers’ editorial page editors – Nancy Ancrum, Rosemary O’Hara, and Rick Christie, respectively – join WLRN’s Tom Hudson to discuss politics and Florida’s environment. WLRN: How has the environmental issue played out so far this primary election season? ROSEMARY O'HARA: We've been trying to put the issue of sea-level rise on the agenda. But what has naturally been on the agenda is what on the television, on the front page of the newspapers. The big green guacamole. These enormous fish kills. Sea turtles, manatees and dolphins showing up dead. People canceling their vacations. So, the environment this year, and really so many years, is about the toxic algae blooms that are affecting both coasts. In part, because of the discharges from Lake Okeechobee. Nancy, I suppose it's natural for voters and politicians to pay attention what is right in front of their eyes. Or in some cases, wafting around the air when they go visit some of these areas. Has it pushed aside the larger, more existential conversation about sea-level rise, resiliency, adaptation, mitigation and the role of the state government as Florida moves forward to try to tackle the issue? NANCY ANCRUM: I was surprised at the degree to which candidates – no matter what party – acknowledged sea-level rise. Maybe not climate change. There were a few who are not quite there yet, but definitely acknowledged sea-level rise and was really clear that whether on the local, state or federal level, something had to be done. People who are elected officials, or want to be elected officials, are concerned almost unilaterally. Rosemary, respond to that in terms of engagement on the part of those seeking political office on both sides of the aisle. O'HARA: It's so hard to keep an issue front and center – especially one that is seen as slow-motion and long-term. Even when I think about the Parkland shooting, and as we go into early voting and the primaries on Tuesday, the shooting doesn't seem to be as front and center as for example the algae. Except in Broward where the school board election is certainly hot and heavy. The challenge is how do you keep something on the agenda that you need to deal with today. It's still an issue that we're not hearing about it on the agenda in Tallahassee and in Washington because those who make the rules up there don't want to put it on the table. ANCRUM: What is also helpful is that – I'm referring back to many of the candidates that we saw for the Legislature and for more local positions – their constituents or would-be constituents are making it an issue because they're living with it. They see the flooding. They see the sunny-day, "I've got to put boots on to to get to my car." Though it may not be on the front page everyday, I think there is an awareness that has bubbled up and that also needs to be maintained. This came out in some voter surveys that were released from the USA Today Network and Florida Atlantic University in early June, well before the red tide was washing up literally on the coastlines in southwest Florida. Well before the guacamole was beginning to pour out. The economy was No. 1. School safety No. 2. The environment was No. 3 at 12 percent of Florida voters saying it was the most important issue for them. Your thoughts? RICK CHRISTIE: I would weigh in and say that I've been a bit disappointed that the gubernatorial candidates haven't talked more about sea-level rise and the environment. Given what Rosemary and Nancy have already pointed out, in terms of what we've seen with the toxic algae bloom, red tides, and even our water issues. And I was a bit surprised when we did our interviews with the gubernatorial candidates, particularly on the Democratic side, that they didn't play to that issue more and talk about it more. As you said, the environment is an issue that is on the mind of Florida voters. Is the environment a winning issue in this political ecosystem? CHRISTIE: I would think so now. As Rosemary is fond of saying, When you got the water lapping at your feet, and when you've got the green goo that you see, and when you've got dead animals floating on the water, that is the time to really talk about it. This post was updated after the Friday, Aug. 24, 2018 episode of The Florida Roundup aired. Miami Expert On How Climate Change Accelerates Gentrification: "It's A Double Whammy"
Caroline Lewis has made it her life mission to amplify conversations around climate change. She founded the CLEO Institute in Miami in 2010 and has focused her efforts on educating the public. This is one of a series of profiles on the major candidates for Florida governor that we're running through the Aug. 28 primary election. Philip Levine has told the story so many times that it sounds like a fable. With $500 in the bank, a young man opened a small office on South Beach, launched a cruise-line media company and created a tourism marketing empire that sold a decade later for a small fortune. The tale is the backbone of a campaign promoting a self-made, blue-collar businessman who as governor would change Tallahassee to make it work for its 21 million "customers."